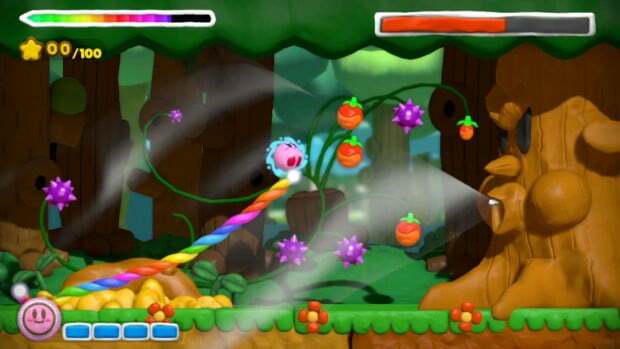 It was almost ten years ago in 2005 that Kirby: Canvas Curse was released for the original Nintendo DS. The title was innovative in the sense that it was a rarity for a Kirby game to remove him of his powers. Instead, this game turned him more or less into a wrecking ball, with the challenge being allowed only a certain amount of “rope” at once. It’d be like a Mario game where he can’t jump or a Sonic game where he can’t run. The game saw wide critical acclaim, so it’s a little surprising that a sequel to the title took as long as it did to come out, but it’s finally happened and the wait has been more than worth it. While a strong story is usually not the big selling point of any Kirby game, this one sees all of the color in Dream Land getting sapped by what initially appears to be the villainous Master Hand (no doubt in a clever cameo as he goes out on his Super Smash Bros. press tour). Though it’s later revealed that these hands in fact seem to belong to another enemy, Claycia, one of the game’s resident end baddies. You and you new paintbrush ally, Elin, must go through the world, restoring color in the process. The strokes of this magical paintbrush are the concept behind the rolling rail-esque control scheme here. The controls definitely have a learning curve to them, not only if you want to enjoy playing this game, but also in order to complete the most precise, grueling challenges that are present throughout (many of which are time sensitive). Make no mistake though, this learning curve does not mean the game is broken or that the controls are even faulty. In fact, they’re deeply smooth and comfortable. I daresay it’s soothing to work your hand about as you guide Kirby on his path simultaneously. It’s still not without its occasional glitches and unresponsiveness, and you’ll surely find yourself cursing at the screen a bunch of times (but in the good, character-building sort of way). The controls just expect you to be on the ball (see what I did there? ), and if you rise to the challenge, you’ll have nothing to complain about. It all leads to some very inspired, innovative platforming. The boss battles function much like the levels themselves, with more of an emphasis on avoiding obstacles as you work your way to the boss to ram into them repeatedly. Unsurprisingly, you’ll find yourself working through the regular library of Kirby’s bosses, showcasing classics like Whispy Woods, as well as new foes like Squid Lance. It Is kind of disappointing that there are essentially only three bosses here, with each of them re-appearing as a souped up version of their previous self. This isn’t a first for a Kirby game, but it just feels like they could have had twice as many bosses (even if they still operated exactly the same) rather than this strange, minimalistic approach. It’s also not as if the Kirby universe is lacking in bosses to pick from either. At the least each fight is fun and cooperates with the controls though. Unfortunately, the worlds themselves are rather small, usually just consisting of merely three levels and a boss, which is absurdly short for a Kirby game. This translates to 28 levels in Story Mode, with another additional 40 stages in Challenge Mode, which is more of an endurance and skill gauntlet. Granted, the levels here are a little longer and more intensive than your standard Kirby fodder, but it still feels lacking. Your different terrains through these worlds tackle the usual staples such as a desert, underwater, clouds (which features a truly inspired piece of platforming involving balloons and spikes that fills you with that great platforming tension that these games need as they’re pushed to the limit), forests, etc. 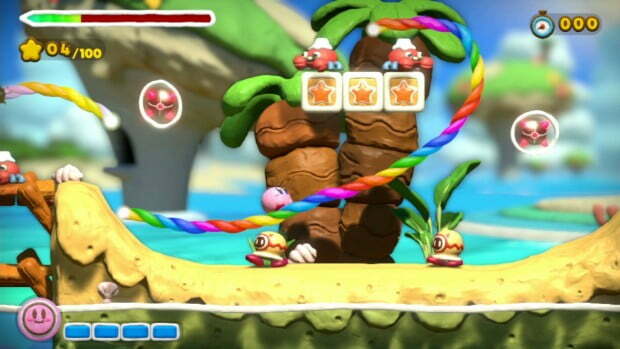 You are allowed a bit of freedom in some of the varied levels where you control Kirby in the form of a tank, submarine, or rocket (in a tactic very similar to the one seen with Yoshi’s transformations in Yoshi’s New Island), breaking up the paintbrush-oriented gameplay and providing a fun palette cleanser every so often. 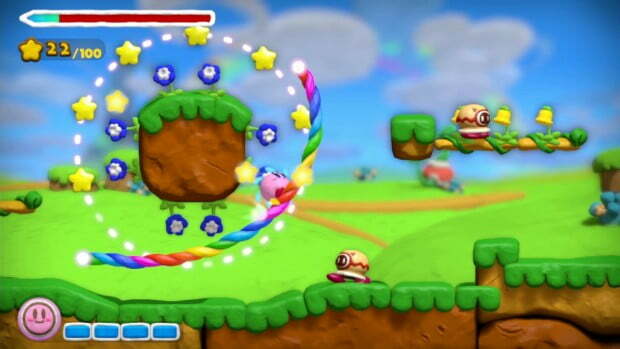 More freedom is also seen with limited abilities, like turning into humongo Kirby and performing a powerful star dash after collecting 100 star points, which lasts for a brief amount of time to clear out space. You’ve probably noticed what this game looks like and it’s certainly one of the strongest selling points. There are absolutely astounding graphics and aesthetics here with the clay design. I honestly cannot go on enough about this. It’s incredibly, mind-blowing stuff that is beyond gorgeous. If this were an independent developer putting out the title, it would instantly be on people’s “Best Of” lists, praising these visuals and designs. That’s not to say that it still won’t, but with the big hammer of Nintendo behind it, people might be less impressed by the style (and they would be wrong). The opening cinematic honestly feels more like an impressive art film than a video game. It tops what they did with Kirby’s Epic Yarn and looks more impressive than what we’ve currently seen from Yoshi’s Wooly World. Kirby titles have always had infectious, catchy tunes, with this game being no exception. The current title kind of kills it with the new music, and there are many tracks that you’ll be begging for in the next Smash Bros. title, in addition to many beautiful renditions and updates of classic tunes—both chaotic and lethargic—as you roll your way through everything. If a soundtrack wasn’t being planned, I’d be surprised. The appropriate, well-done sound effects, like water dripping in cave levels, is the icing on the cake. The Challenge Mode, while certainly not necessary, at least tacks on a little more to the experience, and Kirby titles typically have a history of including superfluous minigames and modes, so one that actually has a little heft to it is appreciated. Then again, this Wii U title is bizarrely being packaged with a “bargain” price of $40.00 (much like Captain Toad: Treasure Tracker was, but that felt like a shorter game), so if you feel you’re getting a truncated experience here, at least they’re charging you less for it. That being said, I think I’d have preferred another world or two included here, even if that meant a higher price tag and a pushed back release date. 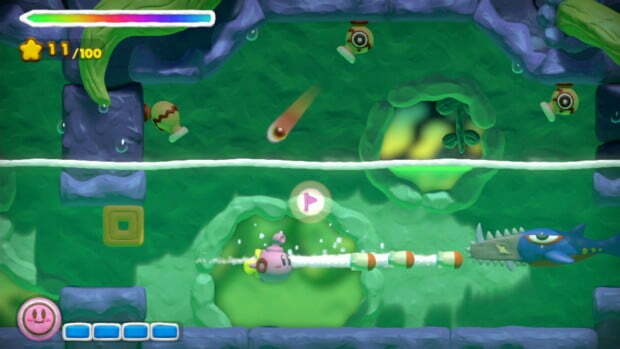 In terms of difficulty and replayability, like most Kirby games, there are five treasure chests (which most of the time contain adorable Kirby-based trophies) to be found in each level, and gold medals to earn based on your performance, and completing these areas unlocks all of the levels and hidden goodies. Again, like most Kirby games, these tasks still aren’t that challenging, but thankfully in this game’s case, merely due to the different control scheme, you do find these requirements being more difficult than usual (the same could be said for its predecessor, Canvas Curse, which also had a higher-than-usual difficulty behind it). It’s worth mentioning that the final bosses in the game are actually rather difficult, which is a welcome surprise. A Kirby game is never going to be the most hair-pullingly frustrating title out there, but this one will at least keep you working for your rewards. One of these rewards – and it’s a tiny detail – includes unlocking pages from Kirby’s book in each stage. Actually looking through the book displays some beautiful, flowing watercolor-esque artwork depicting the game’s story. It’s totally unnecessary and something you might not even check out in the game, but it’s a nice, extra aesthetically pleasing feature that show’s off the game’s style. In another feature that feels like a bit of an afterthought, the game also supports four-player co-op, with one person manning Kirby and his paintbrush, while the other three people control Waddle Dees that move along with you, making your job easier. It’s not exactly the most fleshed out aspect of the game, but it does offer something here for your friends to do. which is a nice idea. Familiar and new boss battles wage clay-based war! The game has also taken part in the newest trend that’s sweeping the nation by incorporating Amiibo support. It’s a bit of a mixed bag here, with the Meta Knight and King DeDeDe Amiibo trophies giving Kirby respective masks of these characters (with the Meta Knight one also increasing your attack power, and the DeDeDe one respectively giving you higher health). Oddly enough, the Kirby Amiibo simply allows you to do his big star dash move whenever you want, which is honestly kind of unbalanced. This is all a little disappointing considering Canvas Curse had many unlockable characters (that were mostly palette swaps, but still). I guess any Amiibo support with extras is still better than nothing at all, but it’d also be nice to have these character mask options without also making your gaming experience easier. Some people may not want the added handicaps. All of this ends up amounting to an extremely satisfying game that’s long enough to keep you busy, but not extremely time consuming if you just want to work your way through it. There’s an amazing art design here with winning, boisterous music backing it up all the way. There certainly haven’t been a shortage of Kirby games in recent years, but if there’s ever been one that’s a mandatory buy and should be the focus of your attention, it’s this one. Even if you’re not into Kirby games, this one mixes it up enough and is such a different take on platforming that you still might find yourself enjoying it. At the very least, you’ll be staring at it in wonder. Kirby and the Rainbow Curse is an extremely satisfying Kirby title that is simply beautiful in every sense of the word. Gorgeous clay aesthetics, a charming, infectious soundtrack, and a delightful, creative art design on every level makes this Kirby game stand out. Unconventional, precise gameplay provide a more challenging platforming experience that is a delight, albeit occasionally frustrating. With the many hidden items and extra content to navigate through, the pros far outweigh the cons here, which really come down to a control style that may take some time getting used to and shortage of levels to work through.